The informal economy has expanded across developing countries during the last decades. Focussing on the Turkish case, the purpose of this paper is to examine the role of neoliberal reforms in this development. 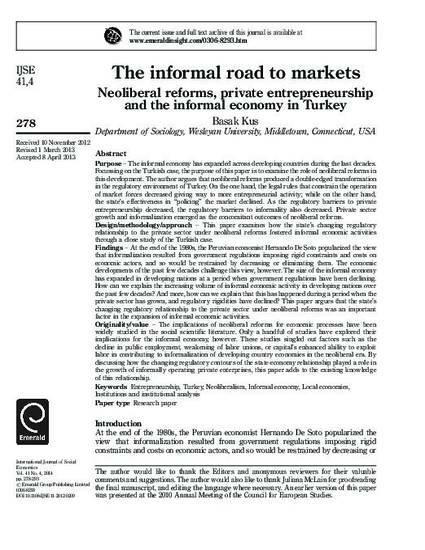 The author argues that neoliberal reforms produced a double-edged transformation in the regulatory environment of Turkey. On the one hand, the legal rules that constrain the operation of market forces decreased giving way to more entrepreneurial activity; while on the other hand, the state's effectiveness in “policing” the market declined. As the regulatory barriers to private entrepreneurship decreased, the regulatory barriers to informality also decreased. Private sector growth and informalization emerged as the concomitant outcomes of neoliberal reforms.